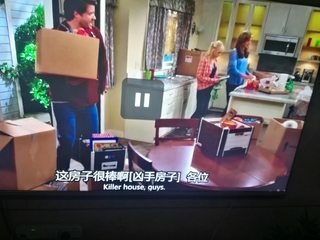 What does 'killer house' mean? I heard it on a TV show. The girls moved in a new house. A man comes to the house and says: "Killer house, guys." There was a murder happened in this house, but that seems not to be what the man intended to say, because the girl had clarified it later by asking: "You meant nice house, right?" I guess it means good or attractive house. It might also be harmful or dangerous house? So, what does it truly mean? Perhaps he's being sarcastic, but more context is needed to determine that. You can find more relevant definitions and examples in the Urban Dictionary entry: killer. Not the answer you're looking for? Browse other questions tagged phrase-meaning phrase-usage spoken-english or ask your own question. What does “but one option” mean? What does “only to see” mean? What does “It is on sale” mean? What does “Savior House” mean? What does “so choose” mean? What does “the house Quidditch teams” mean? What does “Place swimming in soup” mean?